Grease fires can start on or in the stoves and progress up into a greasy exhaust hood, or even start in the hood or ducting itself. When serious, a fire can result in loss of your business and even loss of life! 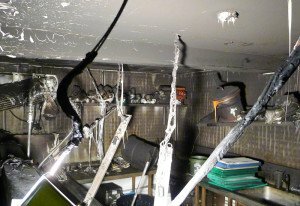 Even a small hood fire can cause a lot of damage to your equipment and smoke damage to the rest of your facility. 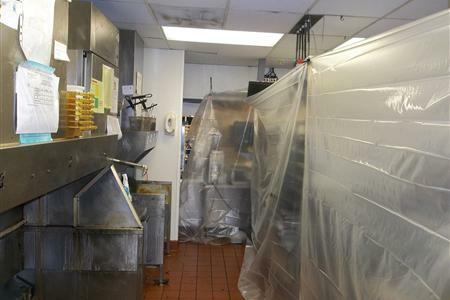 Luckily the stove and hood fire in the fast food restaurant pictured to the left was put out quickly. But note the heavy fire and smoke damage to the kitchen and equipment. The United Association of Mobile Contract Cleaners is a nationwide network of pressure washing contractors that embraces the power washing and mobile cleaning industry. 1.) RPW ProWash covers the cooking equipment with plastic, removes and soaks the filters in a heavy de-greaser, and then scrapes the heavy grease deposits from the hood duct and fan. 2.) 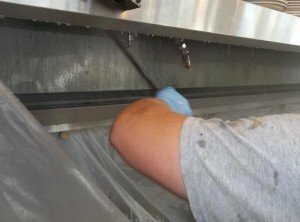 The remaining grease and grime gets blasted off of the fan and hood with hot high pressure and strong de-greaser. 3.) The soaked filters are now pressure cleaned, and replaced into a sparkling fireproof hood. 4.) Everything is cleaned up and the kitchen is left in good Fire Safe order for the next day’s work. 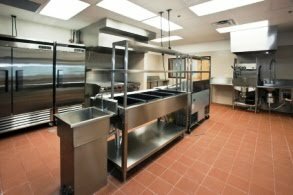 National Fire Protection Association regulations are specifically designed to limit the life safety concerns and fire hazards associated with commercial cooking equipment and rooftop grease containment*. 7.8.2.1 (4) The ability to drain grease out of any traps or low points formed in the fan or duct near the termination of the system into a collection container that is noncombustible, closed, rainproof, and structurally sound for the service to which it is applied and that will not sustain combustion. 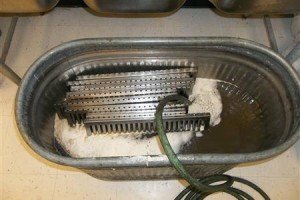 11.6.2* Hoods, grease removal devices, fans, ducts, and other appurtenances shall be cleaned to remove combustible contaminants prior to surfaces becoming heavily contaminated with grease or oily sludge. 8-3.1.1 Upon inspection, if found to be contaminated with deposits from grease-laden vapors, the entire exhaust system shall be cleaned by a properly trained, qualified, and certified company or person(s) acceptable to the authority having jurisdiction in accordance with Section 8-3. 3-2.3 Grease filters shall be listed and constructed of steel or listed equivalent material and shall be of rigid construction that will not distort or crush under normal operation, handling, and cleaning conditions. Filters shall be tightfitting and firmly held in place. 4-3.1 Openings shall be provided at the sides or at the top of the duct, whichever is more accessible, and at changes of direction. Openings shall be protected by approved access panels that comply with 4-3.4.4. Exception: Openings shall not be required in portions of the duct that are accessible from the duct entry or discharge. 5-1.1 Approved upblast fans with motors surrounded by the airstream shall be hinged, supplied with flexible weatherproof electrical cable and service hold-open retainers, and listed for this use. 6.2.3.2 Grease filters shall be rigid construction that will not distort or crush under normal operation, handling, and cleaning conditions. 6.2.3.3 Grease filters shall be arranged so that all exhaust air passes through the grease filters. 7.3.1 Openings shall be provided at the sides or at the top of the duct, whichever is more accessible, and at changes of direction. 7.4.1.3 Openings on horizontal grease duct systems shall be provided with safe access and a work platform when not easily accessible from a 3 m (10 ft) stepladder. 8.1.1.1 Approved upblast fans with motors surrounded by the airstream shall be hinged, supplied with flexible weatherproof electrical cable and service hold-open retainers, and listed for this use. 8.1.5.3.1 Upblast fans shall be supplied with an access opening of a minimum 76 mm by 127 mm (3 in. by 5 in.) or a circular diameter of 101 mm (4 in.) on the curvature of the outer fan housing to allow for cleaning and inspection of the fan blades. 11.6.10 When an access panel is removed, a service company label or tag preprinted with the name of the company and giving the date of inspection or cleaning shall be affixed near the affected access panels. * Reprinted with permission from NFPA 96 Standard for Ventilation Control and Fire Protection of Commercial Cooking Operations ©1998, National Fire Protection Association, Quincy, MA 02269. The reprinted material is not the complete and official position of the National Fire Protection Association, on the referenced subject, which is represented only by the standard in its entirety.